In this guide, we are providing you with the steps to find Apps having access to your Location Data on iPhone and the steps to prevent Apps from Tracking your Location on iPhone. While Apps like Google Maps and Apple Maps do have a valid reason to track your Location on iPhone, there might be other unnecessary or unwanted Apps tracking your location or having full access to your Location Data on iPhone. Luckily, Apple makes it really easy to manage privacy settings on its devices. In-fact many users prefer Apple devices due to the simplicity of the operating system and the ease of managing privacy and other settings. 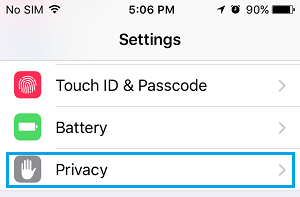 All the privacy settings are just a tap away on the settings screen of your iPhone. 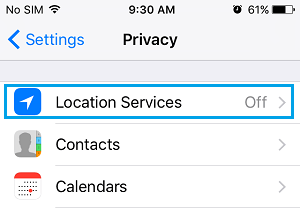 Tapping on the Privacy option on iPhone settings screen takes you to all the major privacy settings like Location Services, Microphone, Camera, Photos and others. This makes it really easy to see which Apps are accessing your Location, Camera, Photos and Microphone. 1. Open Settings App on your iPhone. 3. 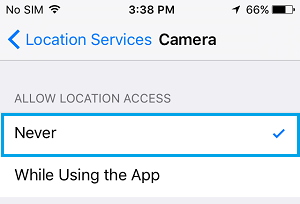 On the Privacy screen, tap on Location Services. 4. 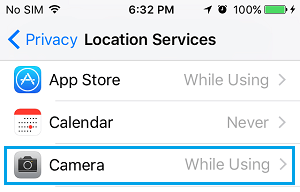 On the Location Services screen, you will be able to see a List of Apps requesting access to your Location Data on iPhone. Simply, tap on the App that you want to prevent from tracking your location (In this case, we’re tapping on the Camera App). 5. On the next screen, tap on Never to prevent this particular App from Tracking your Location on iPhone. Go through all the Apps requesting access to your Location Data and see which Apps have a valid reason to access your location and which ones should not be having access to your Location Data. For example, you may want to allow the Weather App to access your Location Data, in case you want to make sure that it offers you accurate weather information as you move around from place to place. Similarly, you might be OK with Google Maps having access to your location, because you also use Google Maps, in addition to the native Maps App on your iPhone. Going by this logic, you can allow only the necessary Apps to access your Location and prevent all unnecessary and unwanted apps from tracking your location or having access to your location data on iPhone.